Early ragged psych rock from the Dead. Mainly notable for initial runthroughs of familiar set pieces: “Morning Dew” would later appear as a post-apocalyptic denouement; “Beat It On Down The Line” as a mid-first set warm-up; “New Minglewood Blues” as another tiresome Bob Weir blues boogie (which was oddly rerecorded in the late-seventies). But since we can find better versions of these tracks in their live career, this album is more of a curio, a bit too entrenched in 60s psychedelia for its own good. The Dead as we know were much more than that: dark folk, arty improvisation, Jerry Garcia, loose party jams, wharf rat poetry, funky acid freakouts, pirate singalongs, JERRY GARCIA. I particularly don’t care for this 60s calliope pop version of “Cold Rain And Snow” – it sounds like a carefree romp when it should be a cathartic meditation on domestic freezeout. 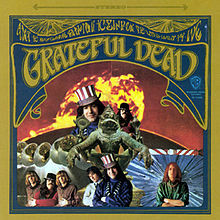 Listen to a later version to hear what the Dead were all about and how they haven’t quite figured it out yet here.